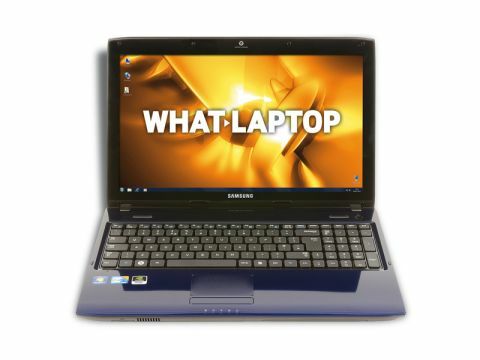 Samsung has impressed us immensely throughout this past year by producing a range of great laptops at decent price points, and the run of good form continues with the R590. It may be one of the more expensive machines from Samsung, but it delivers on all fronts, making this a very flexible option. Samsung has implemented a new paint scheme with this laptop, and the dark blue swirl pattern makes it stand out from the crowd. However, as with all shiny machines, it does quickly pick up smudges and smears, so will need the occasional wipe to keep smart. The 15.6-inch screen features an edge-to-edge plastic finish which looks great, but does produce distracting reflections. It's a very bright panel, however, and colour reproduction is great as a result, but the contrast isn't quite up to that of the excellent Medion. Nevertheless, holiday snaps and movies look great. Build quality is excellent and the solid chassis provides a firm base for the keyboard, which is spacious and very comfortable to use. The isolation-style keyboard is put to great use – and the dedicated numeric keypad is one of the more spacious here. A nice touch is that the touchpad is framed by four blue LEDs which makes locating and using the device in the dark very easy. Everyday performance is excellent. The Core i5 450M's ability to Hyper-Thread, whereby each of the two cores can run two separate tasks, means the laptop can run multiple applications and still show no signs of lag. This means those interested in running resource-heavy programs – or simply after as much performance as possible for their money – should look no further. The powerful Nvidia graphics card also means the laptop will play the latest games with ease, and editing photos and watching DVDs is a walk in the park for this machine. The 500GB hard drive is standard at this price, and you can watch or burn DVDs using the in-built optical drive. Portability isn't the laptop's strongest suit, and the 201-minute battery life is not a great result. Nevertheless, we expect 180 minutes from the latest machines, so this score from such a powerful laptop isn't actually too bad – although obviously it can't compete with the impressively mobile Acer Aspire TimelineX 4820TG.